The morning of March 18 was an exciting one for Shorecrest’s Alpha and Junior Kindergarten students and their families as The Experiential School of Tampa Bay settled into its permanent home in the Mike Murphy Experiential School building. On the first day back from Spring Break, faculty, staff, Experiential School students and families gathered for a celebration to acknowledge this special moment and to highlight the value placed on community-building and family engagement. A “little breakfast” catered by SAGE Dining started the morning’s festivities, which allowed the students and families to get a first taste of the cuisine offered in the Charger Commons dining rooms. The breakfast was followed by some time on the new playground, and a ceremonial ribbon-cutting in front of the doors to the new Mike Murphy Experiential School. 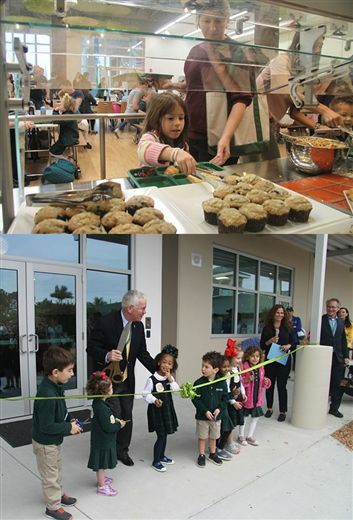 During the February Milestone Celebration, Transform’s earliest donors, Tom Andrews and Jennifer Vesper, and the Sher and Conroy families, revealed their collective decision to honor Headmaster Mike Murphy as the namesake of the section of the building that houses The Experiential School of Tampa Bay. Providing a state-of-the art space for the youngest of the Shorecrest community has long been a major initiative for Mr. Murphy. View photos and video clips from the morning here.